Songwriters will perform their own material. 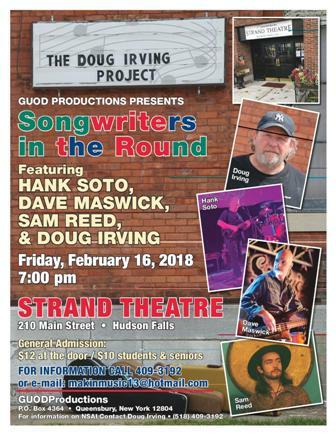 Features Hank Soto, Dave Maswick of Stony Creek Band, Sam Reed an up and coming songwriter, and Doug Irving a seasoned songwriter. $12 general admission, $10 seniors and students. Tickets available at the door. 210 Main St, Hudson Falls, NY 12839. Municipal parking available. For more information or reservations, please call 518-832-3484.